My entry for this week's Flashback Photo is one of my childhood photograph which I am not sure how old I was when this was taken. My Mom probably forgot to put the date at the back. So here it is. Hey! Thats a very cute snap!! have a great weekend! Nyahahahaha you are very cute when you were a kid Hon! You still have the same smile up to now,Sir John!^_^How I wish I have my own childhood photograph with me..
oh my...so cute...hehehhe...thanks for sharing john! What a lovely smile! Happy Friday. Cute overload!! Such a beautiful smile too!! Thanks for stopping by my blog and I love seeing men holding up their family values. Have a great weekend with your family. Be blessed. Well, considering the plaid jacket, this must be the 70's! Probably around the same time as my husbands picture!! That's one cute photo. By the way, I've already added this blog to my list of "Interesting Sites." Thanks for adding my blog in your list, too. Very cute picture, looks like you may have been between the ages of 7 and 9 years old. That's such a nice photo! School pictures are hard to date...you look pretty young here...I'd guess 2nd grade. 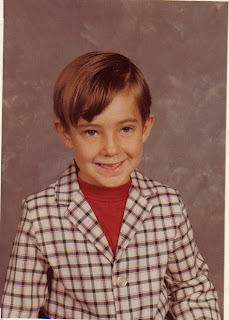 Regardless, you look so snazzy in your sports coat! That is a great picture. P.S. I and my family are grateful for your service to our country. We appreciate all that you do, day in and day out. You look so cute in that picture. Hahahaha you look cute and good in that picture Sir John. oh my John it's no wonder why EJ is cute because you truly are cute, like father like son I guess. Hi thanks for the visit. Voted for your daughter. Best wishes. that's so cute. it surely brings back memories..
only the weight and height changed. the face is still the same. "You were so adorable when you were little, what happened??" I am thinking which of your 2 kids look like you on this picture. Rylie I think..